A country of western Asia, partly under Turkish and partly under Persian rule, although the Kurds pay but little attention to either government. They derive their income from agriculture and cattle-raising, and a goodly share of it from robbery. The Jewish population of Kurdistan is estimated to be from 12,000 to 18,000, scattered in numerous villages, and living in groups of from five to ten houses, or of twenty at most. These communities do not, as a rule, possess a synagogue, but hold services in some house owned by one of their number. 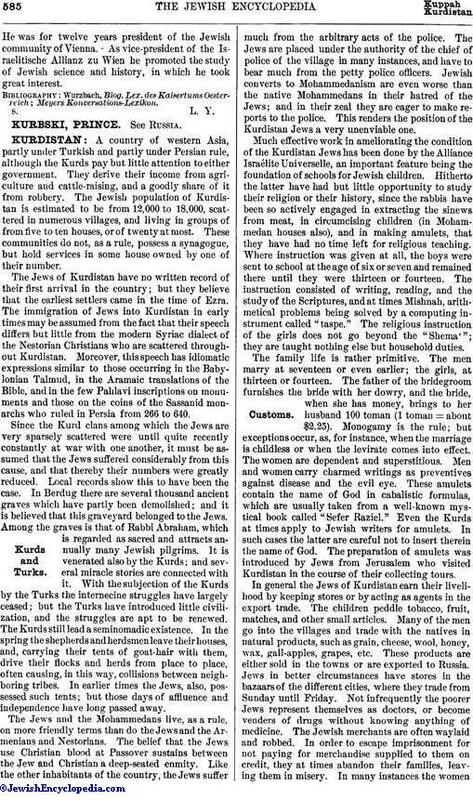 The Jews of Kurdistan have no written record of their first arrival in the country; but they believe that the earliest settlers came in the time of Ezra. The immigration of Jews into Kurdistan in early times may be assumed from the fact that their speech differs but little from the modern Syriac dialect of the Nestorian Christians who are scattered throughout Kurdistan. Moreover, this speech has idiomatic expressions similar to those occurring in the Babylonian Talmud, in the Aramaic translations of the Bible, and in the few Pahlavi inscriptions on monuments and those on the coins of the Sassanid monarchs who ruled in Persia from 266 to 640. Since the Kurd clans among which the Jews are very sparsely scattered were until quite recently constantly at war with one another, it must be assumed that the Jews suffered considerably from this cause, and that thereby their numbers were greatly reduced. Local records show this to have been the case. In Berdug there are several thousand ancient graves which have partly been demolished; and it is believed that this graveyard belonged to the Jews. Among the graves is that of Rabbi Abraham, which is regarded as sacred and attracts annually many Jewish pilgrims. It is venerated also by the Kurds; and several miracle stories are connected with it. With the subjection of the Kurds by the Turks the internecine struggles have largely ceased; but the Turks have introduced little civilization, and the struggles are apt to be renewed. The Kurds still lead a seminomadic existence. In the spring the shepherds and herdsmen leave their houses, and, carrying their tents of goat-hair with them, drive their flocks and herds from place to place, often causing, in this way, collisions between neighboring tribes. In earlier times the Jews, also, possessed such tents; but those days of affluence and independence have long passed away. The Jews and the Mohammedans live, as a rule, on more friendly terms than do the Jews and the Armenians and Nestorians. The belief that the Jews use Christian blood at Passover sustains between the Jew and Christian a deep-seated enmity. Like the other inhabitants of the country, the Jews suffer much from the arbitrary acts of the police. The Jews are placed under the authority of the chief of police of the village in many instances, and have to bear much from the petty police officers. Jewish converts to Mohammedanism are even worse than the native Mohammedans in their hatred of the Jews; and in their zeal they are eager to make reports to the police. This renders the position of the Kurdistan Jews a very unenviable one. Much effective work in ameliorating the condition of the Kurdistan Jews has been done by the Alliance Israélite Universelle, an important feature being the foundation of schools for Jewish children. Hitherto the latter have had but little opportunity to study their religion or their history, since the rabbis have been so actively engaged in extracting the sinews from meat, in circumcising children (in Mohammedan houses also), and in making amulets, that they have had no time left for religious teaching. Where instruction was given at all, the boys were sent to school at the age of six or seven and remained there until they were thirteen or fourteen. The instruction consisted of writing, reading, and the study of the Scriptures, and at times Mishnah, arithmetical problems being solved by a computing instrument called "taspe." The religious instruction of the girls does not go beyond the "Shema'"; they are taught nothing else but household duties. The family life is rather primitive. The men marry at seventeen or even earlier; the girls, at thirteen or fourteen. The father of the bridegroom furnishes the bride with her dowry, and the bride, when she has money, brings to her husband 100 toman (1 toman = about $2.25). Monogamy is the rule; but exceptions occur, as, for instance, when the marriage is childless or when the levirate comes into effect. The women are dependent and superstitious. Men and women carry charmed writings as preventives against disease and the evil eye. These amulets contain the name of God in cabalistic formulas, which are usually taken from a well-known mystical book called "Sefer Raziel." Even the Kurds at times apply to Jewish writers for amulets. In such cases the latter are careful not to insert therein the name of God. The preparation of amulets was introduced by Jews from Jerusalem who visited Kurdistan in the course of their collecting tours. In general the Jews of Kurdistan earn their livelihood by keeping stores or by acting as agents in the export trade. The children peddle tobacco, fruit, matches, and other small articles. Many of the men go into the villages and trade with the natives in natural products, such as grain, cheese, wool, honey, wax, gall-apples, grapes, etc. These products are either sold in the towns or are exported to Russia. Jews in better circumstances have stores in the bazaars of the different cities, where they trade from Sunday until Friday. Not infrequently the poorer Jews represent themselves as doctors, or become venders of drugs without knowing anything of medicine. The Jewish merchants are often waylaid and robbed. In order to escape imprisonment for not paying for merchandise supplied to them on credit, they at times abandon their families, leaving them in misery. In many instances the womenthus abandoned are compelled to sell themselves in order to obtain food for their families. The rabbis, being ignorant and poor, have but little influence, and can not correct the existing evils. In villages where a number of Jews live together they form a community and engage a dayyan, and a shoḥeṭ who also acts as mohel. The head of the community with the advice of the most prominent members determines the taxes to be paid to the government. The burial of the dead is usually conducted three or four hours after death by the "ḥebra ḳaddisha." During the week of mourning the mourners are visited by their neighbors, who bring food with them and share it with the bereaved. Quarrels and difficulties are adjusted by the rabbi, who calls a bet din. When Jews have differences with Christians or with Mohammedans they submit them to the local Mohammedan chief. Bribery often influences his decision. The higher magistrate is a Turk, who lives in Bashkala and receives his uncertain salary from Constantinople. He presides over a local court composed of ten Mohammedans, one Armenian priest, and one Jew. Bajerga: 40 to 50 families. Formerly there was a large Jewish community here, whose members dealt in salt and other articles, but being forbidden to trade were obliged to leave the place. The few remaining are poor. Bitanura: 40 to 50 families. There is in the neighborhood a large cave which is supposed to contain the grave of the prophet Elijah. Israelites from other districts make pilgrimages to it. A few of the Jewish inhabitants are in easy circumstances. Deze: The seat of government; situated in a valley surrounded by fifty villages. There are from five to ten Jewish families in each village, their synagogue being at Deze, which has ten Jewish families. 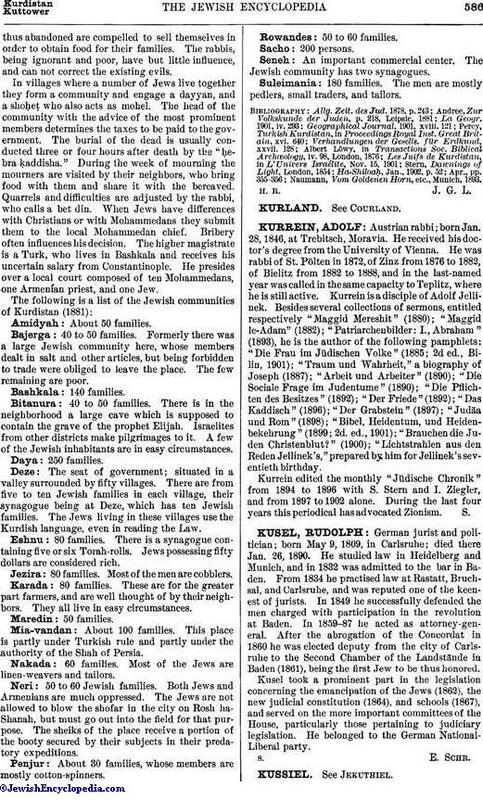 The Jews living in these villages use the Kurdish language, even in reading the Law. Eshnu: 80 families. There is a synagogue containing five or six Torah-rolls. Jews possessing fifty dollars are considered rich. Jezira: 80 families. Most of the men are cobblers. Karada: 80 families. These are for the greater part farmers, and are well thought of by their neighbors. They all live in easy circumstances. Mia-vandan: About 100 families. This place is partly under Turkish rule and partly under the authority of the Shah of Persia. Nakada: 60 families. Most of the Jews are linen-weavers and tailors. Neri: 50 to 60 Jewish families. Both Jews and Armenians are much oppressed. The Jews are not allowed to blow the shofar in the city on Rosh ha-Shanah, but must go out into the field for that purpose. The sheiks of the place receive a portion of the booty secured by their subjects in their predatory expeditions. Penjur: About 30 families, whose members are mostly cotton-spinners. Rowandes: 50 to 60 families. Seneh: An important commercial center. The Jewish community has two synagogues. Suleimania: 180 families. The men are mostly pedlers, small traders, and tailors. Naumann, Vom Goldenen Horn, etc., Munich, 1893.